Please could you give me an idea of how long the ribbons will last on the T104 fax machine when purchased? A single Brother Fax-T104 ribbon lasts for approximately 144 pages at 5% coverage. Therefore, it depends if you buy the single ribbon or a pack, in which case you'll get 144 pages x2 or x3 or x4. Do you have a lower priced compatible refill ribbon for the Brother T104 fax machine? What ribbon number is required for the Brother Fax-T104 printer? If you are just replacing the ribbon and not the whole cartridge then you will need a refill ribbon with the Brother part number PC71RF (single), PC72RF (twin pack) or PC74RF (pack of four). If you need the whole cartridge with the holder as well as the ribbon then the item you will need is the PC-75 black ribbon cartridge. The quality of prints from your Brother Fax T104 printer is great, but have you checked your ink levels recently? The time will come when your Brother Fax-T104 will run out of printer ink, and when it happens you'll soon notice that ordering Brother Fax-T104 ink can be pricey. But you have no need to bother about dishing out the high purchase prices you'll see on the main street because right here at Cartridge Save you can find all the Brother Fax T104 cartridges you will ever need at little cost. Start to save money on your ink by shopping online with Cartridge Save! There's little sense in paying so much for the Fax-T104 original cartridge or Fax-T104 compatible ink in the high street when it is easier to save money buying with Cartridge Save. You get perfect confidence by ordering FaxT104 ink cartridges from us because every single one is protected by a no quibble money back guarantee. Keep in mind that each and every order comes with free delivery, generally delivered to you on the following day! Simple and affordable, the Brother Fax-T104 is an entry-level device for home users and small businesses alike. 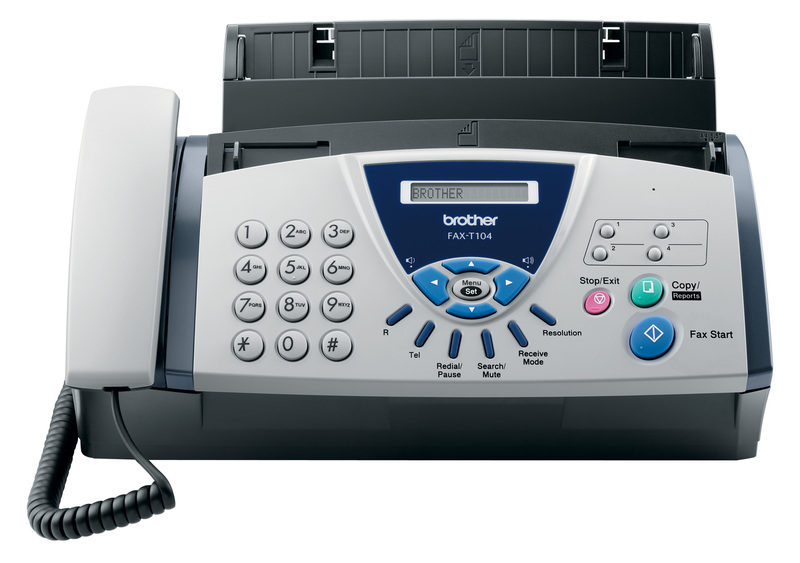 The Brother T104 fax machine is integrated with functions for basic fax and copy needs and user-friendly interface for ease of operation, but the absence of networking features might make it inefficient for workgroups that need to share a fax machine. The lightweight, 2.7kg body of the Brother Fax-T104 printer measures 280mm wide, 191mm tall, and 271mm deep, and it is distinctive for its simple yet attractive monochromatic appearance. There is a corded handset on the left-hand side of the machine, while the front centre is mostly occupied by an angled control panel with dedicated buttons for one-touch copying, faxing, and group dials. The 1-line display screen assists users in operating or configuring the Fax-T104. The Brother Fax-T104 inkjet fax machine is affordable, compact, and with a stylish design that integrates a plain paper photocopier, too. The device comes with a telephone handset for basic communication needs in a home or small office. The comprehensive fax feature of the Fax T104 includes auto-redial, a 9-hour backup, broadcasting, error correction mode, and fax forwarding among others. Another bonus is the 10-page automatic document feeder. It is impossible to integrate the Brother Fax-T104 printer into a network. Paper handling is limited to 30 sheets only, with no options to upgrade. The Brother Fax-T104 fax printer only prints copies and fax messages on thermal paper.